International Journal of Research in Health Sciences,2014,2,4,1217-1221. 1-Associate Professor,Maharajah’s Institute of Medical Sciences, Vizianagaram, Andhra Pradesh, INDIA. 2-Associate Professor,Maharajah’s Institute of Medical Sciences, Vizianagaram, Andhra Pradesh, INDIA. 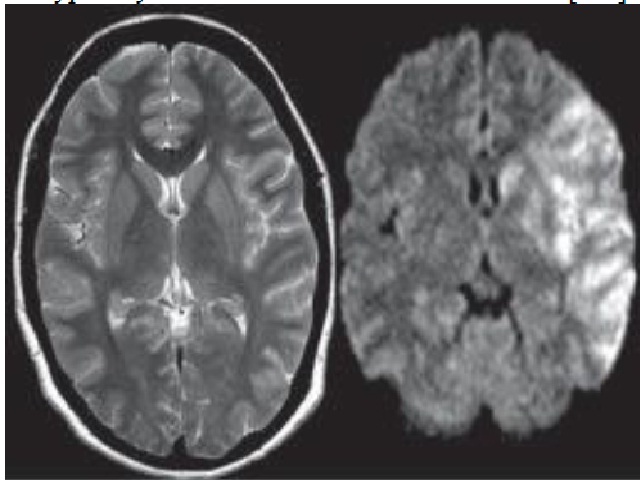 Diffusion weighted imaging is now routine sequence in the MR imaging of the brain and is now the important sequence in evaluating acute ischemic brain injury patients. However high signal intensity on diffusion MR and hypointensity on apparent diffusion coefficient images (ADC), have been reported in other conditions like abscess / tumor. Differentiating between these conditions is required for determination of appropriate diagnosis and treatment. We are presenting a systematic review of our study of hyperintense lesions on diffusion weighted MR imaging in 100 patients and their potential in clinical imaging and application.